There is immense potential of India’s digital revolution for the online school education market, which is estimated to grow to USD 773 million by 2021 from USD 73 million in 2016. With the vision to leverage this opportunity, coupled with governments’ willingness to increasingly invest in quality digital solutions for the classroom, we are spearheading the EdTech Lab initiative. 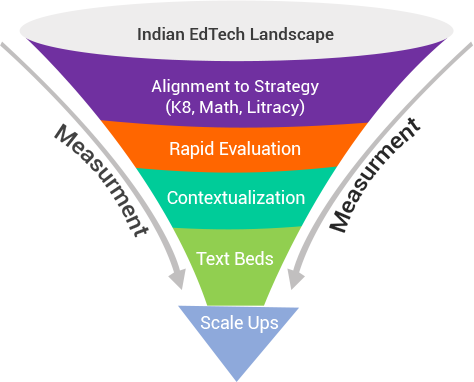 To identify EdTech organizations to partner with for EdTech Lab, we first conducted a landscape of the Indian EdTech ecosystem. Of the more than 4,600 EdTech products currently in the market, we have partnered with 12 promising EdTech players within the K-8 Mathematics and Hindi language domain. Currently, we are working with a research partner on the rapid evaluations for these 12 EdTech organizations. We are evaluating features and outcome indicators such as engagement and product design, through qualitative stakeholder perception as well as MIS Data and Expert Panel Review. Once the results of the evaluations are out, we will create test beds to promote experimentation and adoption of these EdTech products in government school settings and among low-income communities. We also plan to establish a knowledge hub to create evidence on what works and disseminate it with the broader ecosystem.